Pumpkins 4 Sale is all finished up! 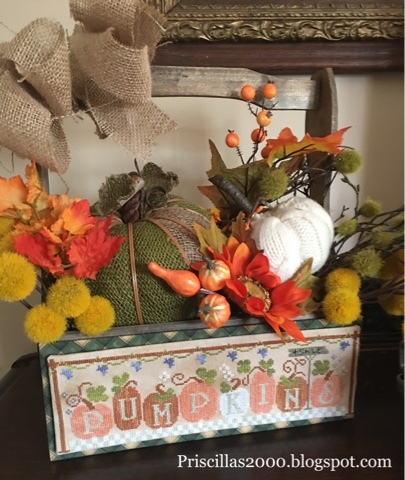 I finished stitching this Little House Needleworks piece on our road trip back from Mackinac Island..
My daughter and I had gone to Hobby Lobby a couple weeks ago and Chelsea saw this wood basket ..It is perfect for the piece! So yesterday I mounted the stitching on sticky board and used some green and cream flannel for the background mat .. I glued those two pieces together and added sheet metal to the back. 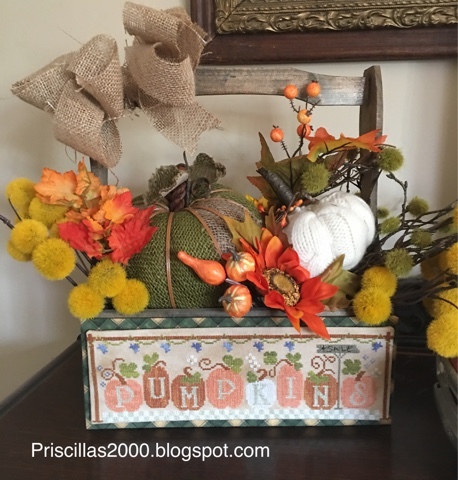 I used magnets on the wood basket ..just in case I stitch something else that would fit on it .. 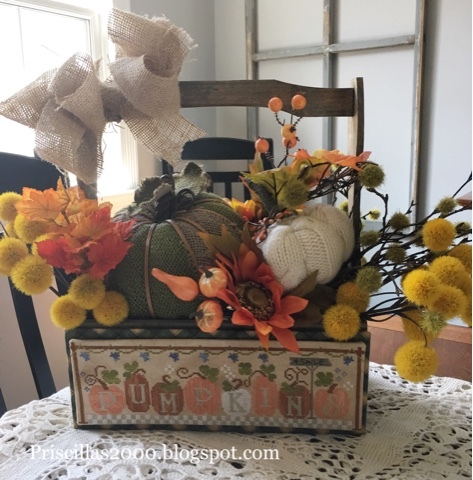 I had fun filling it up with a burlap pumpkin, sweater pumpkin and some Fall picks .. of course I had to add some of my favorite thistle stems in 2 colors! I added a burlap bow to the handle ..and look how fabulous it looks! 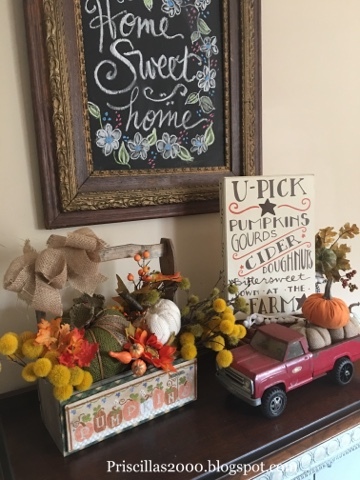 There won't be a new flosstube video today ..but Monday there will be and I will be able to show you the new Chalk for the Home Autumn.. my chalkboard to cross stitch collaborations with Hands On Design! This is fabulous. When you make your next video would you us the sticky back board you use? My Michaels doesn't carry it already sticky so I'm a bit confused. Thanks. Absolutely love all your creative ideas. I have admired the small cross stitch designs for a long time but never came up with clever ideas to decorate with them. Love your podcast but S-L-O-W down a bit. We want to see everything! This is so clever!! I can't wait for Monday and your big reveal! Have a wonderful weekend! I love seeing your beautiful stitching and finishing ideas. Looking forward to your next video. Whats not to love with that arrangement. It's beautiful and clever. Love it. Look forward to seeing your next podcast. 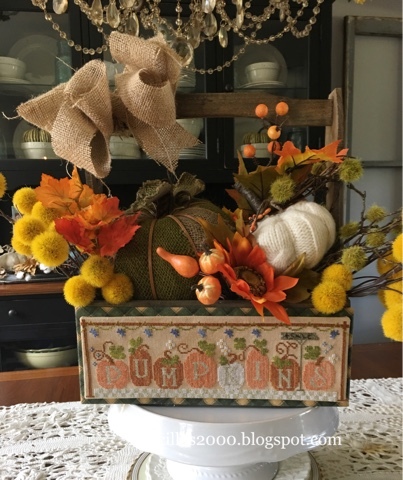 What a great design for Fall! I love it mounted on the box!